Though the long tradition of “snipe hunt” pranks at summer camp has convinced many people otherwise, Wilson’s Snipes aren’t made-up creatures. 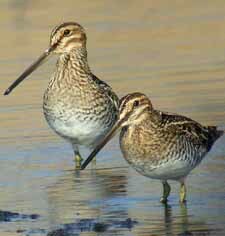 These plump, long-billed birds are among the most widespread shorebirds in North America. They can be tough to see thanks to their cryptic brown and buff coloration and secretive nature. But in summer they often stand on fence posts or take to the sky with a fast, zigzagging flight and an unusual “winnowing” sound made with the tail.